It was written approximately two years ago. As noted herein, Paragon and Poyner & Spruill, followed through on the FRAUDULENT foreclosure sale of Mr. Young’s residence which he shares with his fiancée, Leah Krier and toddler son, Jackson Young. Mr. Young has made it clear the foreclosure is a FRAUD, and that he will NOT under any circumstances vacate the residence that he rightfully owns. 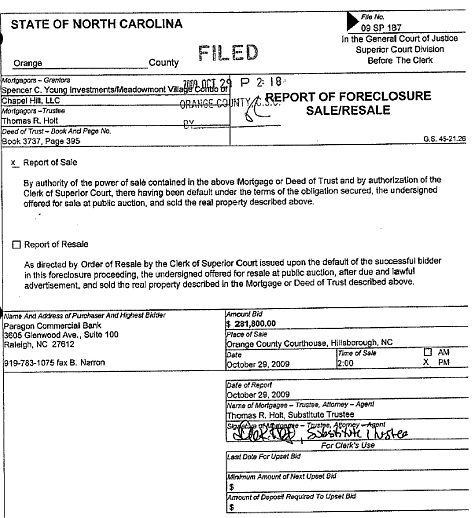 Accordingly, any foreclosure sale would be deemed a fraudulent conveyance and therefore null and void. This explains why their were NO bidders. 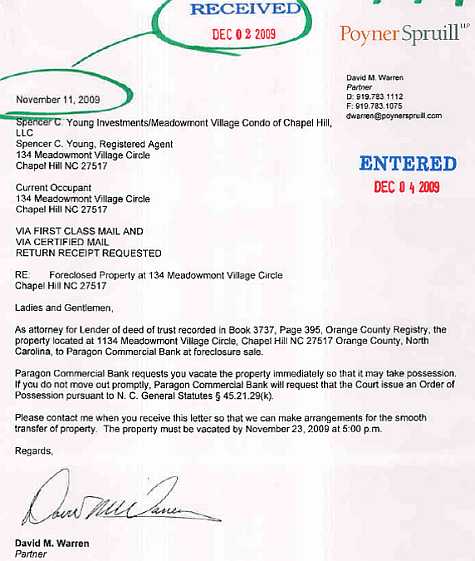 The eviction notice dated Nov. 11, 2009 was issued by David Warren of Poyner & Spruill, on behalf of Paragon Commercial Bank further illustrates what MONSTERS they are. As noted below, they originally tried to render Mr. Young and his new young family homeless just BEFORE Thanksgiving; however, this notice was deliberately withheld so it wouldn't be delivered until AFTER their dastardly act of eviction was carried out [it was received on Dec. 2, 2009]. 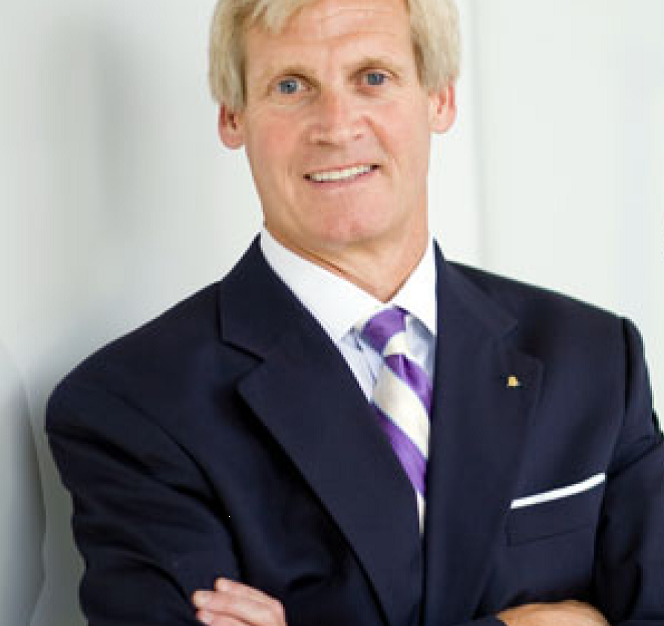 IMPORTANT: Throughout this ordeal, Paragon Commercial Bank and Poyner & Spruill withheld notices to effectively eliminate Mr. Young's ability to thwart their CRIMINAL FRAUD, further evidencing a reprehensible level of deceit that appears to be pervasive throughout these organizations. In other words, there is really no constructive legitimacy to these organizations. Congress did NOT bail out the Banking industry so they could defraud and persecute the taxpayers who bailed them out, and the U.S. Judicial system was not established by our forefathers to be manipulated and gamed in the manner Poyner & Spruill regularly operates.